New analysis by the Economic Policy Institute sheds light on why the job recovery has been so sluggish after this recession. 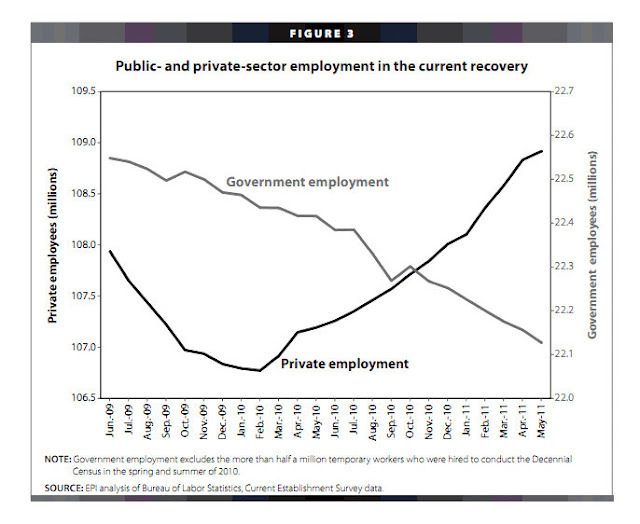 Answer: The overall recovery has been significantly hampered by the loss of PUBLIC SECTOR jobs. This provides further evidence that we need a second stimulus and that an important part of that stimulus should be federal assistance to the states to stimulate public sector hiring. As you can see from the chart below, the private sector has added a net of about 980,000 jobs since the start of the recovery. However, the public sector (primarily state and local governments) has been cutting jobs at the rate of about 25,000 jobs per month. In other words, about 40% of the gain in private sector jobs has been wiped out by the loss of public sector jobs. Overall employment is 0.4 percent higher 23 months into the recovery than it was when the recovery began. At the equivalent point of the previous recovery, employment was 0.6 percent lower than it was at the trough of the recession. In other words, even though it doesn't feel like it, we are further along in job recovery now than at the same point after the previous recession. Private-sector employment is 0.9 percent (or 980,000 jobs) higher than it was when the economy bottomed out; 23 months into the previous recovery, private-sector employment was still 0.9 percent (or 1 million jobs) below its level at the recession’s trough. Contrary to perception, job recovery in the private sector this time has actually been faster than it was after the previous recession. 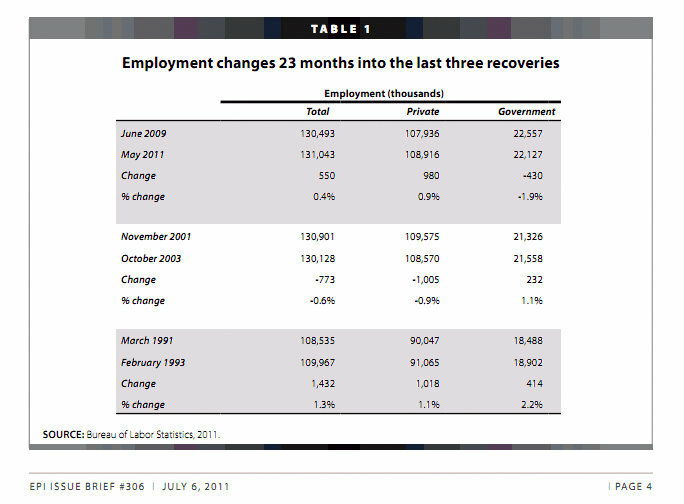 Government employment is now 1.9 percent lower than it was at the start of the recovery, a drop of 430,000 jobs. In contrast, government employment rose by 1.1 percent (or 232,000 jobs) during the equivalent part of the last recovery. Overall job recovery during this recession has been significantly impacted by job losses in the public sector in contrast to the last recession where government employment helped to stem overall job losses. In other words, during the previous recession, government HIRING helped to REDUCE the impact of private sector job losses. That should have happened this time but did not because of strong Republican opposition. Republicans now want to compound the problem of job creation by sharply cutting the federal budget resulting in a loss of federal jobs and a cut back in the remaining federal assistance to the states that has so far helped to stem but not stop state and local government job losses. As always, Republicans are proposing actions that will HURT, not help job recovery and have resisted actions that would HELP create and preserve jobs. If Republicans really wanted to create jobs, they would be working with Democrats to pass legislation to help state and local government not only slow the rate of layoffs of public employees but hire back those who have been laid off.